See, I actually like the closed toe flats with the second outfit - it makes the shorts look much dressier, almost like a skirt. I so rarely wear shorts...unless they are my orange leather ones! Ha, those are the only shorts I have! Thanks Sheila. I might try it again later with different ballet flats, I just hated it that morning for some reason! I'm a huge fan of soft printed shorts and love the ones you're wearing! You look fresh in this outfits Mica. Nice and warm as it's summer here at the moment! I love printed shorts! I think you did a great job dressing up both the shorts, I love the summer vibes from your outfits! And I really love the navy blue bag you have in the first outfit! So cute! And I’m so jealous of your weather. It’s 5° here at the moment and I’m really missing my shorts! Such pretty shorts! I love the print. I find that material is so comfy in hot weather too. Love the shorts! I wish I could wear them now! It so cold in Chicago! I need a vacay stat! I love both of those pairs! They're a great way to spice up your Summer wardrobe without adding unnecessary layers, hehe. Gotta love prints! I'm loving both pairs of printed shorts, and all the ways you styled them. I'm not sure which I like best for the second look, they both look great. It's amazing how changing just your accessories can change your whole look! Comfy linen or cotton shorts are the greatest - super fashionable, but not stuffy. Great outfits! You look so fab! I cannot wait until the warmer weather so I can finally get my shorts back out! These shorts are so pretty and look so comfy! Love how airy and light they are. I can't wait for warm weather here, I am so jealous! Hope you have a wonderful weekend Mica! Hi Mica! You look so summer chic and cute! As always you accessorized the look beautifully. I pray you have a wonderful weekend of sun and fun! The sandals in the second outfit are lovely. I've seen ones like that before but not with the colour difference. I hate it when things take longer than expected, but glad you got some time with your friend. Good thing you were in such cute and comfy shorts too. In the summer, I LOVE turning to printed shorts - they're just so easy! I love both outfits here! Printed shorts, especially in soft materials like this one looks, are my favorites! It'll be a while before I can wear them with our weather, but this is great inspiration for when it warms up. Hope you have a great weekend! Your scarf is absolutely gorgeous. I love the bright blue color you chose. I also love those outfits you put together. I also like the quilted crossbody bag. I do prefer the first choice of accessories with the second outfit, but that might be because I love ballet flats, so I am slightly biased. It looks much more polished. Road trips can be fun if the right directions and estimate of time. I bet your friend was happy to see you when you finally got there! Your printed shorts are cute! haha yes, she was glad when we eventually showed up! Oh how I wish I had your weather. I'm a repeat offender when it comes to styling my clothes too. Nothing wrong with that and you look so pretty. Always love your outfit posts! Unless it's monochrome colors, I struggle with wearing different shades of the same color in one outfit, but you make it look so chic and effortless! Hope you have a great weekend! I love how your bag (and the whole outfit) matches your sandals in the second outfit, it looks so elegant and chic. Very elegant and pretty styling altogether. Neutral colours (black, white and beige) can really take an outfit to a whole new level. I'm a fan of bright colours but I have to admit that these kind of combos look so elegant and stylish. Your first outfit is very cute as well. That blue bag caught my eye! so pretty! You look lovely dear. You look so cute!! I love the shorts. It's so nice to have shorts that are fabulously comfortable for trips and errands!! I love how you accessorize with the outfits too!!! Enjoy your weekend. We are celebrating my mom's 80th birthday!! These are cute outfit! I really love the style of the shorts you are wearing in both outfits! They look so comfortable and I love that it almost has a skirt look to it! I feel terribly boring in my denim shorts at summer - patterned shorts are most definitely the way forward I think! I definitely need to do some digging into Rebecca Minkoff, every time I come to your blog I fall in love with a new bag! I have so many Rebecca Minkoff bags, I can see why, haha! It's my go-to brand at the moment! I can't wait to be able to wear shorts again. These printed shorts are so cute on you and I see that gray shirt again (oh, so versatile!). I didn't know you had a YouTube channel. I have one, too, but I need to post on it more often! I'm going to make more of an effort at YouTube this year, I need to post on mine more often too! great outfits! so pretty and enegrgetic. Oh I wish it was summer for me now! These are such cute summery looks, I love those shorts! How fun that you got to take a road trip to visit your friend! Traffic is the worst though--good thing you got to stay a bit longer. Yes I'm glad we could stay a little longer to make up for getting there late! Such cute outfits, love those shorts! I'm loving your first black bag! So cute! Hope you had a great weekend! What a cute summer look! These shorts are adorable. These are great looks, Mica. Loving the sandals as well. Wow, lucky you for that being your longest drive ever. That is usually my regular commute. Traffic is never fun though, especially with roadworking. Oh wow, I can't imagine driving that far and back each day, that's a huge commute! Mine is about 30-40 mins depending on traffic. Awe, love this cobalt blue LV scarf, this will be so useful and stunning on the cooler months. Nice to see a bag from Rebecca Minkoff that looks like one from Balenciaga. Great selection dear! Another hot weekend in Sydney too, we had a nice lunch at the Bulli Tops, perfect spot during hot days. Yes I love how she is so inspired by Balenciaga - it's why I have a large collection of Rebecca Minkoff and Balenciaga bags, haha! Congrats on your road trip!! I think an hour and a half is the furthest I've driven too. I'd love to do it again, wasn't as bad as I thought it would be! Indeed fab shorts. I love how you've styled them. I too love printed shorts! I bought my first pair two years ago and I was impressed at how the small details can really add to an outfit. I love both of your outfits here. I do like the tank top a bit more than the grey t as the top portion. And I never got into ballet flats though I own two pairs that is staring at me begging to come out of the box! Lol 😂 It's great that you got to catch up with your friend. It's always nice to catch up and a nice change of pace from the norm. My friend who lives in LA is preggo with her second one and I am excited to see her in April during my son's spring break. Hope you are having a super weekend! I've really been loving printed shorts this summer! A staple in my wardrobe for sure. Dear Mica, so sorry the drive to your friend took longer than expected - even as it was the longest drove he had so far ... but as you were so happy to see your friend it was obviously worth the effert. Love the look you wore, perfect for the occassion and the weather. YOu are so right Rena, it was definitely worth the longer than expected drive to see my friend! Love these looks! 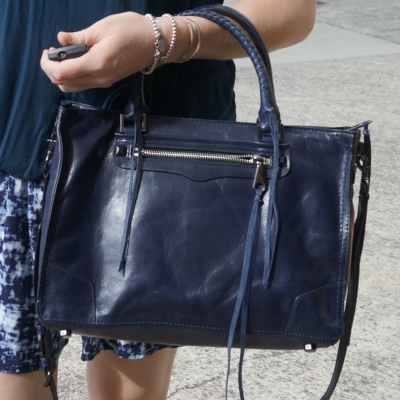 That navy Rebecca Minkoff bag is amazing. Hope you had a great weekend. haha, I do love her bags! Such cute summer style! Love those shorts! I love the shorts! It definitely adds a fun statement to a simple summer, casual look! Love this looks! I hate when Google is wrong and I'm late! Eek! You looked great regardless though! We’d love for you to join our link up today! Hi Mica, I liked the all blue outfit and at least you were comfortable enough for that long drive! I think the flats look cute with that outfit but I also really really like the sandals! Great design so they go with black and tan / neutrals. Yes they have been such a good addition to my wardrobe! Picked them up at the Wittner outlet on crazy sale a few years ago, so worth it! Yes, I like the sandals with the outfit. Glad the playdate went well. Google can mess up! HaHaHa It's happened to me. Yes it's done it to me before, I should have been more prepared, haha! Thanks all for your lovely comments - shorts like these are really proving to be a staple in our humid summer, it's been so hot here in Brisbane! This is the year I am absolutely GOING to jump on the soft shorts train! I love all your combos. I need to just go for it. Plus, I feel like the bagginess will camouflage some new mommy tummy issues I have.